Q. Where is the bus drop-off point at Harriet Island? A. Bus drop off at Harriet Island will be along Dr. Justus Ohage Blvd. Buses are recommended to use US 52 to Plato Blvd. Please avoid dropping off along Plato Blvd. See map for routes. Q. Where is are the bus drop off and pick-up points at the Capitol? A. Buses should use the Marion St ramp from I-94. Bus drop off- and pick-up will be along John Ireland Boulevard and Cedar St. Buses will only be allowed on Cedar Street after the march. Overflow bus loading has been requested at Capitol Lot X (next to Sears). Q. Where can buses go after dropping off? A. They should park somewhere near the Plato Blvd/US 52 junction. At 10:30 am, they can go to the Sears parking lot on Rice Street. Take US 52 NB to I-94 WB and exit at Marion St.
Metro Transit Trip Planner can be accessed here. Q. What is the best way to get to Harriet Island? Q. What is the best way to get to the Capitol? A. We recommend that you take Metro Transit services to get to the Capitol. Metro Transit routes 3, 62, 67, 16, 21 and the LRT Green Line (Capitol/Rice Street Station) serve for those coming from the west. Routes and 68 and 71 for those coming from the east. Additional services have been requested from Metro Transit. Alternatively, you can take any transit service to Downtown St Paul and walk to the Capitol (15-minute). A. Parking near Harriet Island is limited. Some adjacent lot owners may charge for parking. 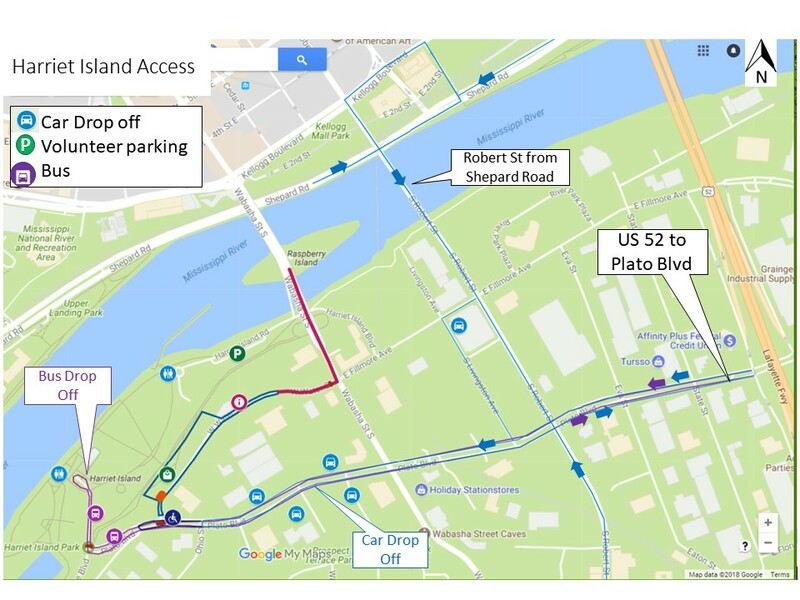 We suggest parking at one of the ramps in downtown St. Paul and walking across the Wabasha bridge (15 minute walk) to the beginning of the March at Harriet Island Regional Park. Cars should use the 12th Street (EB) and 7th Street (WB) ramps from I-94. 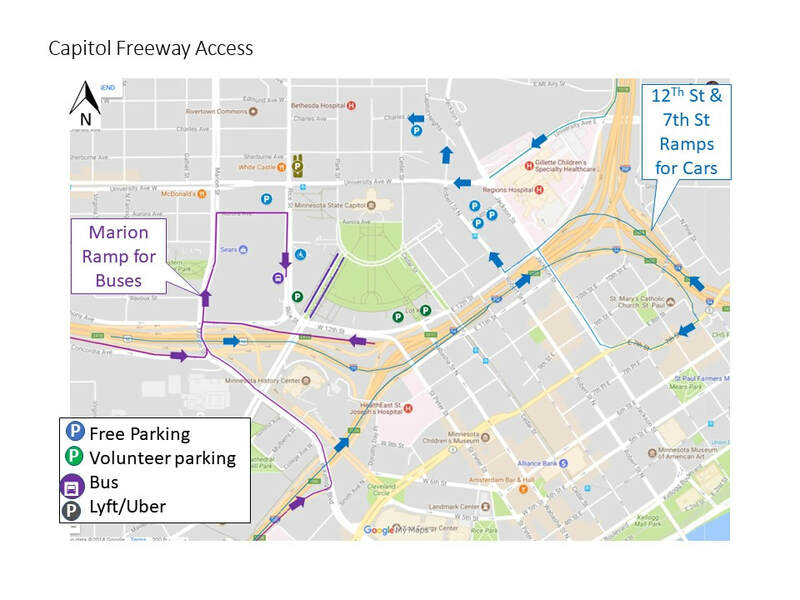 Free parking will be provided around the capitol area. See map. Cars should use the 12th Street (EB) and 7th Street (WB) ramps from I-94. Q. Where is the car drop-off at Harriet Island? A. Car drop-off will be along Plato Blvd. Please look out for marshals that may direct you into one of the car parks for unloading. Q. Where is the car drop-off at the Capitol? A. Anywhere legal except along Rice Street and Marion Street area, which is reserved for buses. Q. Will there be any transportation back to Harriet Island from the Capitol? A. No, we will not be providing rides back to Harriet Island from the Capitol. Q. Where is the handicap accessible parking? A. Accessible parking is available at ground floor Ramp F (MnDOT building). Accessible drop off is at Cedar St and Aurora Promenade. Q. Will there be bike parking at Harriet Island? A. No additional bike parking will be provided other than those already in the park. You are free to walk your bike on the March. Q. Will there be bike parking at the Capitol? A. Here is the link to bike parking map. A. We will not be providing transportation back to Harriet Island after the March. Q. Will Lyft be providing free rides? A. We have not received any commitment from their local office. Watch out for updates.